Zentangle® is almost as popular as coloring this year. Go into any craft shop, and you can find the small 6- or 7-inch blank tiles used for this popular drawing method. Originally, zentangle designs were intended to be complete with just the designs drawn with ink. 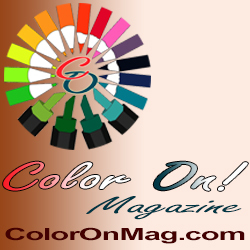 As coloring has become popular, however, people started to add color to their zentangles. 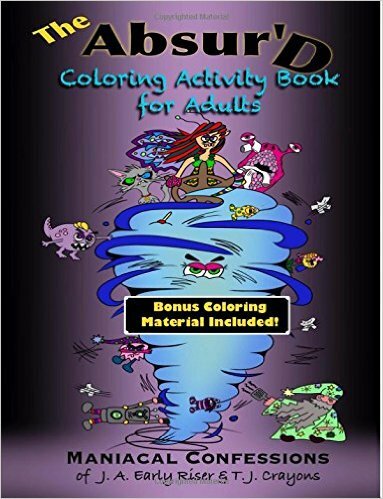 Now, zentangle artists are starting to produce designs in books for others to color, as in this book by Vicki Michael, although she uses the word “maze” for her designs. The designs in this book start out with just one or two patterns, and progress to much more complex tangles with multiple patterns and with lines closer together. At the start of the book, Vicki shares a couple colored patterns to give you a sense how the designs will look with color. At the end are several blank pages where she encourages you to create your own patterns to color. The designs in this book are clearly scans of Vicki’s hand-drawn tangles on square tiles. The designs are not just line art. Some of the patterns have heavy shading, and even areas completely filled with black. In general, the designs seem very dark, as even the areas not shaded are a grey color, due to the scanning process. I have to admit that if I were the artist, there are some things I would have done differently for these designs. First, I would have done some processing on the images after scanning so that the background was pure white. Second, I would have increased the size of the images to more fully fit the 8-inch width of the page, and chosen a square book size so the margins were uniform. Finally, I would have left blank pages between each design so that colorists wouldn’t have to worry about using markers to color the designs. 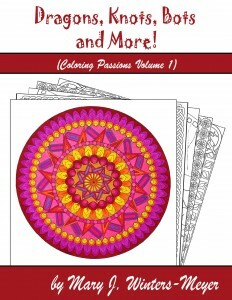 All that said, if you like Zentangle art to color, you will probably enjoy this book.